If you’re a mature single looking for a second chance of love and companionship then SeniorSoulmates.com is the site for you. Specializing in matching up single seniors, you’ll find it easy to use even if you’ve never tried online dating before. Plus, since more and more mature singles are turning to online dating sites, this is a great place to start. With an online community of over two million active singles, you should have plenty of potential partners to choose from. The dating site is set up with practicality in mind. So all SeniorSoulMates features have been designed to be helpful and of use in your search to find a suitable partner. If you find someone who catches your eye, you can initiate contact by clicking a button that says “show interest”. They will then receive an email alert which links to your profile. You even have the option to send a “Mega Wink” which blasts a message to a crowd of members at the same time. It can be a good way to get things going if you’re new on the site. There’s also an option to see who is online at any given time.Then, when you find some members you’re interested in, you can set up a favorites list for easy access to their profiles. Upgrading to a Gold Membership gives will give you instant access to other members one-on-one through live video instant messaging, and you’ll also be able to send private emails to one another. In terms of support, a handy help section will tell you almost everything you need to know. In addition you can email SeniorSoulMates.com if you want help with something specific. 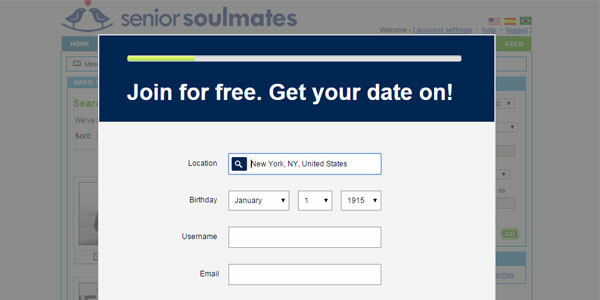 The sign up process for SeniorSoulMates.com is straightforward and quick. At the start of the process you’re told it should take about a minute, and it really doesn’t take much longer than that. You’ll first be asked to sign in with your date of birth and email address, and will need to create a username and password. You can then add an image of yourself or decide to add that later. You will then be presented with four panels asking you to add a physical description of yourself, include some interesting details about you such as your faith, education and occupation, and whether you drink or smoke. Another panel will ask for a description of some of your interests. For example whether you’re geeky, a film buff or bookworm and to describe the attributes of your ideal date. There are options and tick boxes on each of these for pages, which makes it quick and easy to select your options. Of course, the more specific you are, the easier it will be to get matched up with your ideal date. SeniorSoulmates.com takes safety very seriously. Even before you sign up there is a set of guidelines you can access with safety measures and advice about how to date safely online. The site will never disclose your email address or personally identifiable information to other users. In addition, the site is protected by SSL (secure socket layer technology) which encrypts any sensitive information you enter such as your credit card details to ensure that all your information is kept safe. The site allows you to create a profile and browse other members free of charge - which is a great way to test it out. It’s even free for you to send messages to other users. Although, if you want to read their replies (which no doubt you will) you will then need to upgrade your membership. However, you don’t need to make a long commitment until you’re ready and can just sign up for a month initially at $29.95. There are discounts, however, if you sign up for a longer period. Based on three months, it works out at $19.98 per month, for six months $14.99 a month. While for the full year it’s just $10.00 per month. This SeniorSoulMates review found that they have tried to make the website as user friendly as possible. There aren’t any unnecessary options and it’s easy to find what you’re looking for. Clear tabs along the top will instantly take you to the various features you’ll want. While if you need to contact SeniorSoulmates.com, a link to a contact form is the first option in the footer. So there is no need to hunt around trying to find anything. There are also useful little hints along the way such as a link for writing tips to help you get started when you’re ready to write a detailed profile about yourself. 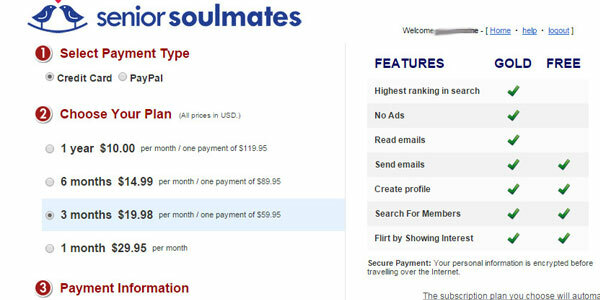 Based on the details given at sign up, SeniorSoulmates.com will give you matches that meet your basic search criteria and let you know the approximate geographical distance from you of potential dates. There is also a search facility enabling you to manually find your perfect partner by age, distance and by using specific keywords of your choice. There’s also an advanced search where you can select from optional criteria - with the use of helpful tick boxes - to tailor every aspect so as to find your perfect match. You get to define what is really important to you when looking for your ideal partner, whether that is physical attributes, career and education. Even their faith or star sign. Once you have done this, you can then save your searches. A handy way to check if there’s anyone new who matches your wish list. 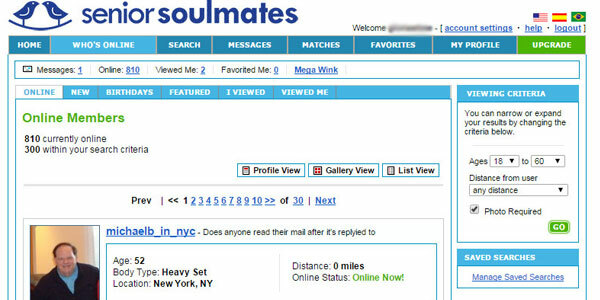 SeniorSoulMates.com is the ideal place to begin your search for a new relationship - even if you’ve never tried online dating before. Because you can join for free, it enables you to find your way around the site and get to know it, before committing to any membership options. However, if having gone through all potential matches on the site and you still haven’t found what you are looking for, then read our review of OurTime.com, a site dedicated to helping mature singles find their match.